This winter, a team of 6 British Army Reservists set out to cross Antarctica. 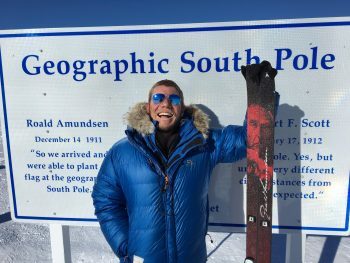 Ollie Stoten (OW) was 2nd In Command of SPEAR17 (South Pole Expedition Army Reserves 2017). The plan was simple enough: a ski-plane would drop the soldiers on the Ronne Ice Shelf, 730 miles from the South Pole, with 2 months of food, kit and equipment to survive in the most hostile climate on earth. On reaching the Pole, the team would collect a resupply and continue for another 400 miles to the Ross Ice Shelf, in doing so traversing the continent. The team would then be picked up by another ski plane to fly them home. In reality, they faced an uphill struggle hauling pulks f 120kg from sea level up to 9,000ft to reach the Pole. Relentless headwinds, freezing temperatures, sastrugi (frozen ridges of wind-blown snow) upturning pulks, and the constant physical toll of skiing for 10 hours a day became increasingly demanding. Injuries, infections and frostbite harassed them daily, but they slowly chipped away at the distance. Eventually, after 39 days and a big push in the last week, they reached the South Pole on Christmas Day, becoming one of the fastest teams to ever cover the distance, and having a huge cause to celebrate. One team member was flown home from the Pole, utterly broken by the toll of the expedition. Most expeditions in Antarctica stop at the South Pole, but the team loaded the pulks with another 30 days of food and fuel and continued the climb to 11,000ft, crossing the Titan Dome. Temperatures dropped to the -50s (°c); the heavy pulks felt like an anchor through sand; their tired bodies degraded further. Eventually they reached the Trans-Antarctic Mountains and descended the Shackleton Glacier. After climbing slowly uphill for 1,000 miles, the downhill, which they’d craved so much, had begun. However, the Great White Queen had some tricks left up her sleeve. Crevassing plagued them, navigating the glacier now on crampons to grip the diamond hard blue ice. Their pulks slid wildly out of control hitting the back of their legs and pulling them towards crevasses. The temperatures warmed every day and every 100m descended, slowly thawing the team out and allowing their frostbite to heal small amounts. Finally, after 1,100 miles, 600 hours of man-hauling, 2,304,900 calories eaten and 66 days 3 hours, they set foot onto the Ross Ice Shelf, completing one of the hardest, longest and largest expeditions to date. Weight loss and physical degradation is a well-documented and dangerous problem in polar expeditions, slowing progress, causing extreme tiredness, illness and at worse, death. With Ollie planning a carefully formulated diet, and endless physical preparation with 7R Performance (OWs Adam Jordan (2000-2008) and Michael Jordan (2002-2010)), the SPEAR17 team lost far less weight than expected and were in such good shape when they finished the traverse, they ran a marathon in Antarctica before flying home. They proved fitness is better than fatness for polar exploration, a paradigm shift in attitude. Ollie admits he was not academic or sporty at school, and hopes to inspire the younger generation to push boundaries. He has already returned to Whitgift to talk to the pupils, and will be returning to give several more presentations.